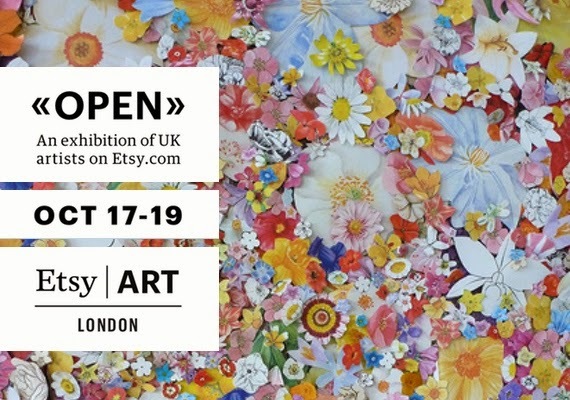 Etsy the site where you can buy items direct from crafters and designers, has some great artists as members, and to celebrate this they're holding a real world exhibition in Shoreditch on 17th - 19th October. Go along to see and buy some art, and even play the 'art tombola'! "OPEN is an exhibition featuring the work of 15 artists from the online marketplace Etsy.com. Displaying a range of practices from painting and fine art ceramics to printmaking, this is a showcase of a diverse mix of styles, practices and subjects. Curated by Lena Nix from Space Studios, Matt Roberts from a-n and Katherine Mellor. The exhibition will be celebrating the accessibility of original art that can be found on Etsy.com. We will be running workshops with the help of curator Katherine Mellor throughout the exhibition on 'How to start your own Art Collection' and 'How to Frame & Hang Art'. There will also be an 'art tombola' of limited edition prints priced at £10. The participant will pay £10 and receive one the prints at random. Our aim to make buying art simple, accessible and fun."